This year, Analog Way (Booth 3323) is celebrating its 20-year anniversary, and in addition to exhibiting at InfoComm, the manufacturer will offer training sessions focusing on Soft-Edge Blending. Among Analog Way’s featured products will be the Di-VentiX II, a Multi-Layer Mixer Scaler Seamless Switcher with universal analog and digital input/output and full high-resolution digital processing. It can display up to seven layers -- four live sources, one frame, one logo layer, and one mask layer. Live layers can be customized. Di-VentiX II offers numerous live effects, including keying and moving PIPs, as well as three different operation modes: multi-layer mixer, standalone embedded soft edge blending, and eight by two seamless native matrix. Di-VentiX II is fitted with eight universal analog inputs, including four fitted with digital DVI and SDI. 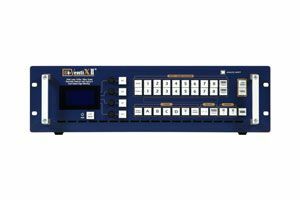 With 100-percent digital processing, the Di-VentiX II outputs digital and analog signals in SDI, DVI, and VGA (RGBHV) simultaneously with a selection of many formats from HDTV to Computer 2K. Multi-screen soft edge blending, either horizontally or vertically, can be achieved by linking multiple Di-VentiX II, updated with the Cross Blender II option. Di-VentiX II will be demonstrated with the remote controller Axion.